The past two months seem to have flown by, with Christmas and New Year taking up a bit of time for planning and delivery. Soon after the last blog, we went exploring the paths on the east side of the big river here in Licata. We cycled past a stables where they were lunging one of the horses – which we later saw pulling a two wheeled carriage on the road. We got to the end of the paths, high above the current water level with big flood defences leading down to the river. There were a lot of cormorants and egrets sitting on the pipes that crossed the river. On the way we saw lots of small greenish birds fluttering around the bushes – probably serins, and herons and moorhens down in the rushes. However there wasn’t a lot else, but it was a very pleasant afternoon out. As we are in Italy, i.e. a European country, we have been taking advantage of the ability to get stuff ordered and delivered without customs problems. The first batch of things to acquire were electronic components for Brian’s redesign of our control panel – including all sorts of current and power usage displays which had previously been a bit of a hotch potch of wires and use of multimeters. Many of these components were delivered from Hong Kong, so it took a few weeks for them to arrive. I set up an account on Amazon Italy – using our Nationwide credit card that does not charge commission on foreign currency purchases. Then we set up an account on the Italian Radio Spares site – Brian has a UK account but they wouldn’t deliver to Italy. This caused all sorts of problems as the Italian site needed a tax number to validate the purchase! To cut a long story short, Maria in the marina office finally and very kindly gave them her tax number and it all went through. Just for a couple of fancy meters! Much preparatory work was needed to put in partitions and shelves to prevent components disappearing down the back of the cupboard that houses all our electrical control panels. Thin wires to provide the feeds for the meters were also needed to be threaded from the battery area. Brian realised that network cable has 8 cores and would work, so I managed to get a 10 metre length which is now installed – further work to drill holes to thread it through various bits of internal woodwork! The project continues and hopefully the results will be pictured in the next bulletin. 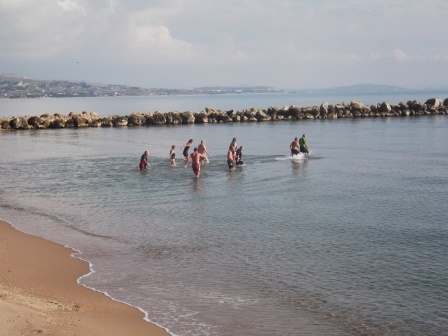 During this time we met Yannis – a Greek chap on a boat on our pontoon. I had seen him a couple of days and then we saw him in the bar we went to in the evenings and got chatting. It transpires that he is also a nuclear physicist – but high energy – and works at Cern and other places that Brian knows well. He was just in Licata for a week, organising repairs to the bow of his yacht. An incident with a stuck anchor had pulled his windlass off its mooring bolts and in the process had cracked the front of the boat. He had recruited one of the local shipyards to carry out repairs, but they would be continuing after he left as they had to put on many layers of fibreglass and resin to repair the crack, and then fit a steel reinforcing plate. To this end he had had to dismantled his forestay (the big wire that holds the top of the mast to the front of the boat) and rig up a couple of ropes temporarily to replace it. I agreed to keep an eye on his boat to ensure that the mast was OK if it should become windy! Fortunately it has been OK. While waiting for electrical components to arrive, Brian dismantled the Eberspacher heater (diesel/hot air) to ensure it was OK for the winter. We had turned it on and it seemed to blow out a lot of smoke from the exhaust and then stopped. A second try though seemed to make it work OK, but we knew the thermostat wasn’t working. He cleaned up all the contacts and put the heater back in its hole at the back of the boat. Not an easy job as there is only access through a small hole at the back of the starboard cabin, which is where Brian keeps all the boat repair gear as well as various large things that we don’t use often. After that it worked fine – just in time for the colder nights – and the thermostat works really well – you can hardly hear the heater going after its initial high energy blast. Brian did the sums for the cost of heating (we pay 30 cents per kwh) and decided that diesel was cheaper so we have been using it since. During his exploration of the pipework, Brian decided that a rearrangement of the hot air tubes would be more effective. To that end we ordered more pipe, a couple of junctions and a service kit to be sent from the UK. Another box of stuff that is now in his cabin and will be installed sometime before next winter. A further exploration of Licata revealed a big shopping centre at the other end of town which we visited. It has a big DIY store from which we picked up a few useful things, but other than that there isn’t much that we can’t get more locally. 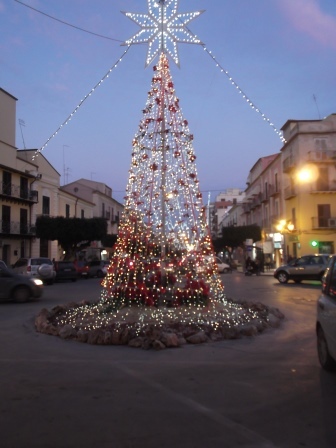 We were treated to more “Licata History” for a couple of weeks but that has not been resumed since early December. It was interesting, but some of the stories had to be taken with a large pinch of salt! We went on a guided tour of some more archeological sites at the end of November. This time I remembered to pack a flask of coffee and some biscuits to keep me going – which were much appreciated by one or two others with whom I shared the goodies. 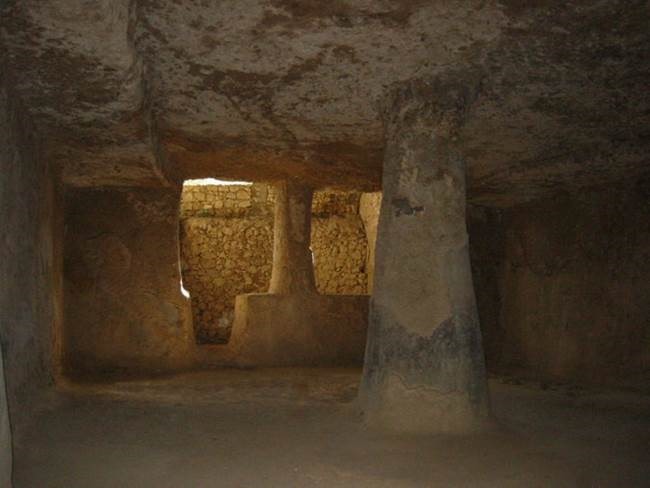 We admired some of the local palaces from the outside and then went into the “tomb of Minos” (possibly) which did seem to be similar to those of Agamemnon in Mycenae. We explored the ancient Greek ruins outside the hilltop castle and then went to the Stagnone Pontillo – an amazing stone cave with some remaining wall decorations and pillars supporting the ceiling. 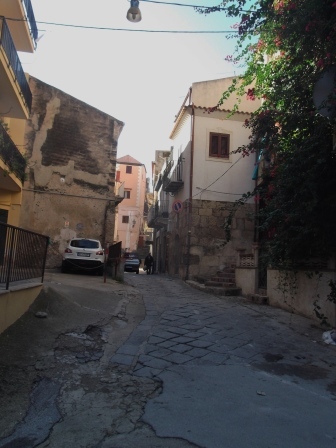 After that we went (by coach) to the other side of the hill that Licata is built on. The river that flows down the east side used to also flow out on the west side. There is still a river bed but no water. So originally the town would have been guarded on all sides by river and sea. An island off the coast is supposedly where Daedalus built one of the castles requested by King Corcorus who gave him sanctuary from Minos. Now we have been invited to a series of “Walk/Food” events that take place on Sunday mornings. Three of us went to one before Christmas – just to join in at the food bit! 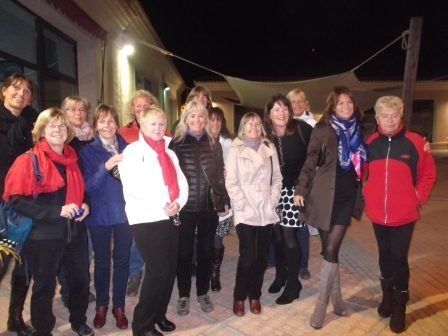 It was interesting to meet a group of Italians who had enjoyed a 9 km walk around the city. They treated us to a very nice lunch of local wholemeal bread and olives and other salads. 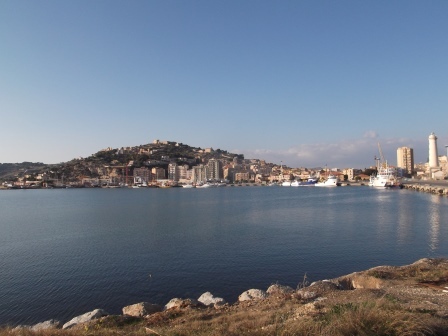 The idea to include the marina in the walks was to get locals talking to us – but I fear their English or German and our Italian doesn’t quite match up to expectations! The next walk is this Sunday and about 20 of us are going – so we will see how it goes. A couple we had met here (Dave and Annie on “Serenity”) were headed back to the UK and to visit friends and relatives in Canterbury. When I mentioned that Jessica (my sister) has kept my parents’ house in Broadstairs they asked if they could stay there for the two weeks they would be in East Kent. After a bit of negotiation Jessica gave her permission and I spent half a day writing out instructions on how to get there and where everything was! Jessica and Mark were setting off for their usual winter Australian/Asian conference and holiday tour so didn’t have the time. Dave and Annie treated us to a very nice dinner in thanks before they left – and Dave cleared out the gutters while they were staying there! Good man. About the same time, realising that our main laptop was getting a bit elderly (they don’t last quite so long in our harsh environment) I did some research and ordered a new one from Laptops Direct in the UK. After a week I had had no tracking information sent to me and made further enquiries. Eventually after much pushing they found that our laptop had been returned to them – no reasons given. It was sent out again and arrived just before Christmas – phew. We were conscious of the weeks passing and needed to book our haul out to get the boat prepared for the next season of sailing. Matt Patterson is a young man who has set himself up as a yacht support person in Licata – I think he is from New Zealand. So I enlisted his help to arrange our haul out and hopefully to provide some labour as well. We subsequently booked our slot for 17th March for the usual 2 weeks, but if Matt and his friend will be working as well, we may not need so long! Hopefully the weather will be kinder than it was last year in Monastir. 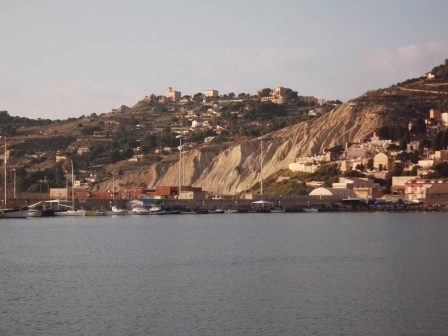 I also booked 2 weeks in an apartment up the hill from the harbour so we won’t be living on the boat – as usual. It was December already and plans were being made for the Christmas Party. I had decided to try to make a pork pie, and needed to experiment. First of all, I had to find beef fat for the hot water pastry! Not something that you find in Italy. I managed to persuade a bemused butcher to give me 2 kg of raw beef fat and rendered it down in the oven. 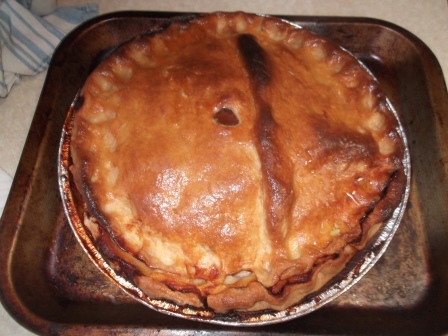 Then followed the recipe and made a large round pork pie – an interesting experience! I took it along to the Sunday barbeque to see what people thought – I was mobbed as I set it on the table, and had to quickly reserve two slices for Brian and myself before it vanished in front of my eyes! Much enjoyment was heard. So I was booked to make pork pies for the Christmas dinner. An initial planning meeting of those involved also set Brian to assist with setting up the electricity supplies for hot plates and to provide the Christmas music. He spent a lot of time sorting out some of the music we had “acquired” from our friend Colin in Turkey which already had a directory of Christmas songs, and adding other music that we liked along with it. 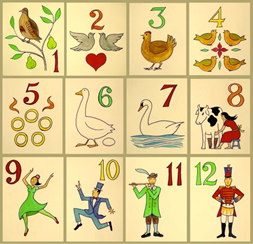 I prepared song sheets for “The twelve days of Christmas”. I also offered to make “Sussex Pond Puddings” as I have a big box of Atora suet to use up! Brian meantime had felt that we were lacking an event for yachties to share technical experience. With some input from others we managed to secure a reservation in the marina café for Tuesdays at 5pm and these events now occur weekly. There is a lot of knowledge out there so we set a different topic and speaker each week. 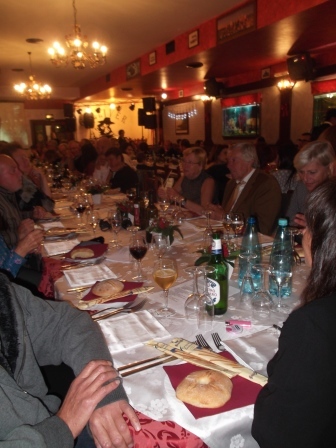 It is a good group (about 8-10 people attend each week) and is different from the other social events that are arranged here and that we find a bit overwhelming. In mid-December a hen and stag party was arranged for a couple who were returning to the UK to get married. I went along to the hen party – we all had pink sashes to wear and the bride to be had a miniature fluffy tiara and veil perched on her head. We headed to a local bar to get started, then off to a very nice fish restaurant that was renowned for its mussel dishes – deservedly so I found. After that we headed back to the Las Vegas café near the marina to meet up with the stag party. The bride and husband to be were much embarrassed by their previous answers to questions about each other – it was all great fun and it made a nice change to chat to the ladies of the boats for a change! It was time to start preparations for Christmas and we finally found the “Chinese” shop that had been recommended for cheap Christmas lights etc. Not only did we find a new set of lights to decorate the boat (old blue ones up the spinnaker halyard at the front, new multi-coloured ones up the main halyard at the back) but Brian also found a digital measuring thingy – his old one had broken and he had had to get a cheap non-digital one to replace it. Much happiness. 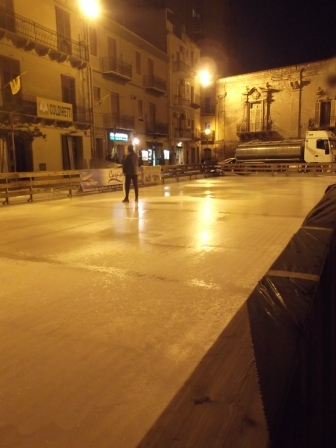 The town was all decked out with Christmas lights and they even created an ice rink in one of the squares. I had intended to go and try it out but have never got around to it. 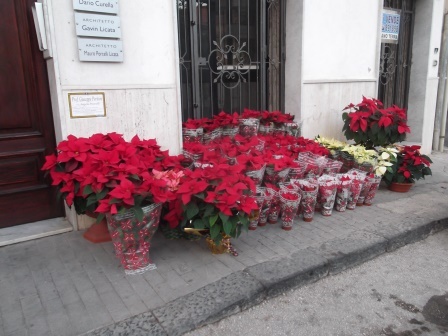 The flower shops were full of poinsettias and the supermarkets were full of panettone boxes – which are now stacked up and being sold off. Unfortunately, one evening in the week before Christmas Brian managed to catch the back of his calf on the pedal of his bike, making a huge gash in his leg. He didn’t notice it until the next morning by which time there was a fair amount of blood on sheets and soaked into his tracksuit and socks. I spent the morning washing the blood out in cold salty water and helping him put a bandage on the wound. The local advice was that if it was more than 12 hours old, there was no point in getting stitches put in. Another couple of people helped out with melanin dressings and antibiotic gel. He wasn’t a happy bunny, but it is now healing. It didn’t stop us from the final preparations for the Christmas dinner. I made 3 oblong pork pies, Brian finished off the song collection and the lights were up! On Christmas day we opened the box of our new laptop! It is a very pretty silver, so we can distinguish it from the current red one. The party started at 3pm and eventually all the food arrived from the various boats. It was an enormous spread. A Finnish couple had bought a big turkey and cooked it in the new wood burning oven in the barbeque area, Desiree had made a huge pot of sprouts, Birgit had made a huge pot of rotkohl, and several of us brought roast potatoes – plus all the other things that people had made with lots of international flavour. It was excellent. Desiree (the chief organiser) told us all to bring a multi-choice trivia question – so in between courses we answered those in groups (we didn’t do very well) and sang the 12 days of Christmas, the music group played Silent night which people sang in every language, etc. We all brought a small gift that was put under the tree and a fun game was had – if you didn’t want to open a present you could pinch one that had been opened and that person then had to go again – or again take someone else’s that you coveted! The evening ended about 7pm – time to clear up and retreat to our boats feeling very full and having had a very enjoyable evening. After a relaxed Boxing Day (there was a Boxing Day swim in which I didn’t partake) I started to load up our new computer. First I wanted to make a retrieval system copy just in case I needed to go back to the original settings (Windows 7). I had 6 DVD’s but ran out so had to beg a couple off another boat – to be replaced when the shops opened again. I then headed up to the Yacht Club that has free wifi, and down loaded Windows 10 and bought a copy of MS Office 365 – a new version of Office that you pay an annual subscription for instead of a one off price – and you can load it onto as many as 5 other devices! So that took quite a while – I took my Italian homework with me to do while it was all loading. Later that week I loaded our navigation software onto the new computer – the most important part for us. It all worked fine (after wasting an hour using the wrong version) until I tried to plug in the GPS and AIS signals from our boat – it couldn’t find the com ports. After a few tries to sort it out I decided to leave it until another day – Brian needs the area where these connections are located to work on his new panel. I spent a few hours sorting out how Windows 10 works and got rid of some of the built in stuff that we don’t use, as well as managing to find out where to prevent it automatically updating Microsoft software. When you are working on Pay as you Go internet access, the last thing you want is for software updates to gobble up your spare gigabytes. We save up the updates and go to a free wifi site to get them uploaded every so often. More recently I have moved all our photos onto the 2nd newest computer as well as all the blogs I have written since 2009. I spent another afternoon in the yacht club moving the older blogs that had been published on Posterous onto the Microsoft “OneDrive” cloud facility that came free with MS Office. Then I found out how to post the links from those onto the individual blog posts from 2009 in WordPress – so now all our blogs are public again – I think. The conversion from Posterous to WordPress just hadn’t worked, which I only found out about 6 months ago. 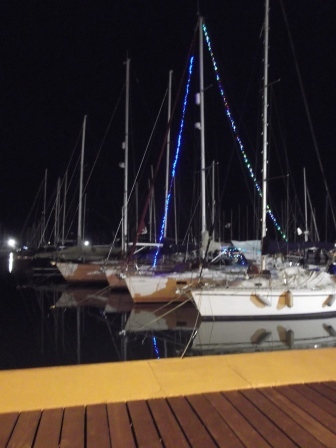 Then it was time for New Year’s Eve – I had booked a place for the marina party. We all started off in the marina café for aperitivo, then headed off to a local restaurant that was putting on dinner for the event. 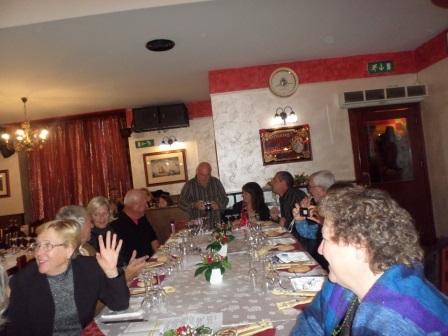 There were about 25 of us sat at a long table surrounded by parties of Italians – some of whom were there the year before and recognised some of those who had been here last year – much shouting and merriment. A man and woman were on stage with electronic backing and belted out songs of all types – rock, Italian folk and blues. Bottles of wine (and water) kept appearing by magic as they quickly disappeared. The five courses of dinner were brought out with long gaps in between so we could digest – but I was careful not to eat too much of each course! The food was very good considering they had to feed about 100 people all at the same time. Several of the yachties are quite outgoing (boisterous might be a better word) and got people up to dance – forming a big conga line around the restaurant at one stage. Finally midnight arrived – the restaurant staff had put out bottles of Asti Spumante for the occasion and we all cheered and wished each other a happy new year. It was great and very much fun. I stayed for another half hour or so, then made my way back to the boat with a few other party poopers and to bed – planning a good lie in the next day. But horror – I remembered that at 9am on New Year’s Day I had to provide the “Net” broadcast (a VHF communication on channel 69 to all the yachts in the harbour). It is an information and feedback facility with a set agenda that we read out so that those who need help or advice can tune into three times a week and get responses. Our day is Friday (so I had to do the Christmas Day one as well). I did manage to wake up in time, did the broadcast much to the amazement of those listening (yes there were a few). Being awake now, after a few reviving cups of tea I cleaned the fridge (overdue), read a book then went back to bed after lunch for a well-deserved siesta! A few days after that Brian found that his Acer tablet, which we use as our shared internet provision (it has a facility to act as an internet hub with other devices) stopped working. We pushed every button and tried to restart it with no success. It had been going a bit funny for a month or two which we had been resolutely ignoring. 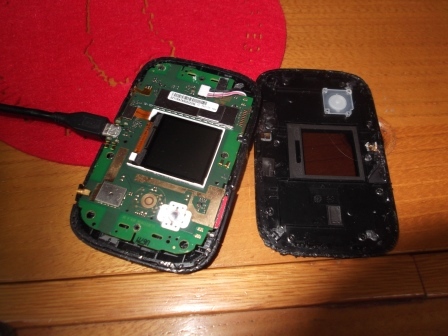 However, we had long ago bought a “mifi” device that provides the same facility so we dug it out and I slotted the micro sim card into it – oops. It wasn’t a micro slot at all – and the sim card disappeared into the depths. After a half hour trying to extricate the card with no success we decided to open the device to get at the slot from the inside. Another hour later, with shims stuck into the crack we had managed to make around the edge, a bit of brute force finally got the two parts apart – it was welded together with internal plastic posts! The efforts to get it open had messed up some of the internal contacts too. Then we found that the sim card slot was still under the PCB that held all the electronics – that was screwed down to the base of the device with tiny allen key heads. We didn’t have allen keys that small, so we drilled them out (smoke and melted plastic) and finally got the thing apart. Eventually we got the micro sim card out – put it into a holder and slotted it back in – and it worked! Molto amazing. Then I had to find the instructions on how to set it up, but eventually got it all working. So after that (much relief) I headed out to the local computer shop to see if they could fix the tablet. I returned the next day to find that they had had no luck either. After a short discussion we decided that it was more economical to just buy a new one. Another half day was spent reviewing the types available and then placing an order with Amazon to get it – and all the other bits associated (like a protective cover). But I had also decided to replace our very old phone that we use for voice communications in foreign parts – so a new smart phone went on the order too. And our new computer has Bluetooth, so a few Bluetooth bits were added. It will be another Christmas when they all arrive! As you can tell, it is all fun and games when you are totally dependent on wireless access to communications without a base (or required ID) to set up contract deals. I am looking forward to learning how to use a smart phone though. Meanwhile normal stuff carries on – shopping, washing, cleaning etc. 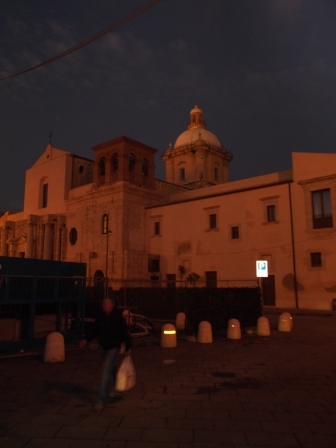 I have found the local bulk wine seller where we get the Sicilian Nero d’Avola red wine out of the barrel at 80 cents a litre – and very good it is too. The local DIY shop provides useful items – like ridged rubbery sheeting that I have put under our bed to try to cut down condensation which the whole boat suffers from at night. The sun shines most of the time – although it was a bit wet over the Christmas week. The weather has been very mild, but heavy dew falls each evening. Most mornings we can sit out in the cockpit and drink our tea and luxuriate in heat – even to the extent of stripping down to T shirts – and we eat our lunch outside most days as well. However we have given up our nights out at the local bar as it is too cold now to sit outside for any length of time once the sun has gone down.